Many thanks go out to I Spider for nominating me for this award. (This post also nicely coincides with my 100th post! 🙂 ) So, thank you I Spider – I have been enjoying the excerpts from your book but as I am petrified of spiders some of the posts have freaked me out a little! I know, I sound really pathetic…I wish you every success with it nonetheless! I. Visit and thank the blogger who nominated you. 3. Share a random thing about yourself. A random thing about…I always have to sleep on the left side of the bed…is that random enough? 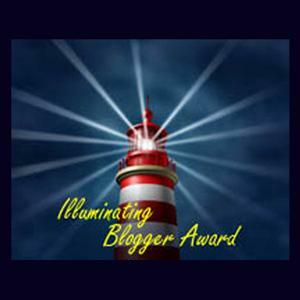 This entry was posted in On My Travels and tagged award, awards, Illuminating Blogger Award. Bookmark the permalink.